342 pages | 60 B/W Illus. Developed by the authors, generalized structured component analysis is an alternative to two longstanding approaches to structural equation modeling: covariance structure analysis and partial least squares path modeling. Generalized structured component analysis allows researchers to evaluate the adequacy of a model as a whole, compare a model to alternative specifications, and conduct complex analyses in a straightforward manner. 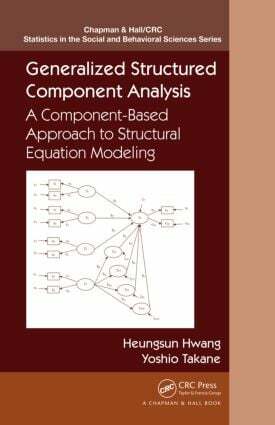 Generalized Structured Component Analysis: A Component-Based Approach to Structural Equation Modeling provides a detailed account of this novel statistical methodology and its various extensions. The authors present the theoretical underpinnings of generalized structured component analysis and demonstrate how it can be applied to various empirical examples. The book enables quantitative methodologists, applied researchers, and practitioners to grasp the basic concepts behind this new approach and apply it to their own research. The book emphasizes conceptual discussions throughout while relegating more technical intricacies to the chapter appendices. Most chapters compare generalized structured component analysis to partial least squares path modeling to show how the two component-based approaches differ when addressing an identical issue. The authors also offer a free, online software program (GeSCA) and an Excel-based software program (XLSTAT) for implementing the basic features of generalized structured component analysis. Why Generalized Structured Component Analysis?